Which do you feel, is a superior email client? GMAIL 5.0 (Lollipop update) or INBOX (by Gmail)? 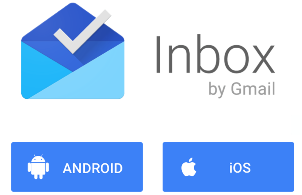 So, being the software addict that I am, I asked for an invite so I could check out the fabled new addition to the Google stable... INBOX! So What Does STYLEZ Think? So then I moved on to understanding INBOX and the bundling, and the sweeping, and all of the other organization tools it flaunts! And I must say, between the mobile app (on Android) and the website, I am impressed. I actually never really got motivated to do the labeling/tagging in Gmail. It was never user friendly to me. I found the new Gmail 5.0 on Android was better. But with Bundles in INBOX, I feel more in control and pre-organized so that I can focus on what I'm doing and get it done, versus flailing my arms all over the place with random messages just filling up my mailbox daily! The only "major" gripe I have right now, is to perform more complex selections (based on advanced filters), you still have to rely on the old Gmail website, but other than that INBOX's website and mobile app are easy to use and very helpful in getting what's important, right in front of me! Also, the addition of some of Google Keep's features (reminders) is an added bonus, since I love that app too. I'm impressed, and hope with (a little) time, it will totally replace all of my email clients and fulfill my digital needs! And finally, if you're interested in getting an invite to Inbox, please let me know, I believe I have one or two I can send out! Then you can get organized too! That is what Stylez thinks, what do you think? Please comment and share!